“It would give me great pleasure to work with you to design a beautiful ceremony that reflects your personalities. I am happy to follow your dream and perform the ceremony barefoot at the beach or taking in the beautiful scenic views from a mountain range or enjoying the seclusion of your own home garden. From your initial contact, I will be happy to provide you with a general information sheet that will advise you of my price and my availability. If you are happy with what you have read, then we go to the next phase. I would like to offer you and your husband / wife / partner a Free Meet and Greet meeting. 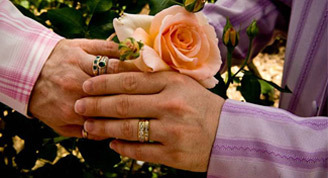 It is not a hard sell, and I offer this because I feel you need to be comfortable with the Celebrant you choose, allowing you the opportunity to express your thoughts and plans for the day whilst giving me the opportunity to share how I can personalise your ceremony so that it truly reflects the both of you, and your love story. Once you are comfortable that I am your Celebrant of choice, then we start to work together so that we can create your dream ceremony. We are now ready to conduct your Commitment Ceremony. 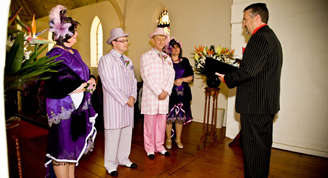 You may be wishing to celebrate your love via a Commitment Ceremony to formalise your Engagement which is a very exciting and momentous time in your lives or you may be a Step Parent who wishes to make a declaration to your new family. What ever the occasion, your Commitment Ceremony will bring you a lot of joy because it is simply a celebration of your love and what could be better than that? If you would like make contact, please go to the ‘Contact Me‘ page in this website to send an email or find my phone number.